Summer to me is synonymous with experimenting with film cameras and this one looks like SO much fun! It's no secret that I have a bit of a blush problem. I used to be all about the bright colours, but now I'm finding myself only reaching for more muted, peachy neutral shades. They're much softer, easier to wear and more flattering on my skin tone. I'm having a hard time justifying buying yet another blush to add to my collection, but I'm certainly tempted especially because this is a shade I think I'll reach for a lot. My only summer shoes are almost certainly going to fall apart very soon. I'm not exactly sure what I'm looking for when it comes to replacing them, but I'm currently thinking something simple like these. I like the two tone colour, it adds a little something without making them too bold or overly detailed. Nomads is one of my very favourite clothing brands. I have a couple of pieces from them and they're excellent quality and have washed perfectly. Midi dresses are usually my favourite, but there's something about this maxi that is calling my name! I seemingly now cannot step foot in Ikea without leaving with a new plant. They're just too enticing and I love having little pops of green around the house. This sounds like a perfect crisp, fresh, fruity scent to burn on summer evenings. Sweet bakery scents are my favourite during colder months, but fruity scents are definitely my favourite when it's warm outside. Because we need to save the bees! Is there anything on your wishlist right now? A bee house! Haha that's interesting. I wonder how you'd start it off. Love those sandals - very simple but pretty. Im the same & can't leave IKEA without a plant. I love the sandals, they are lovely! 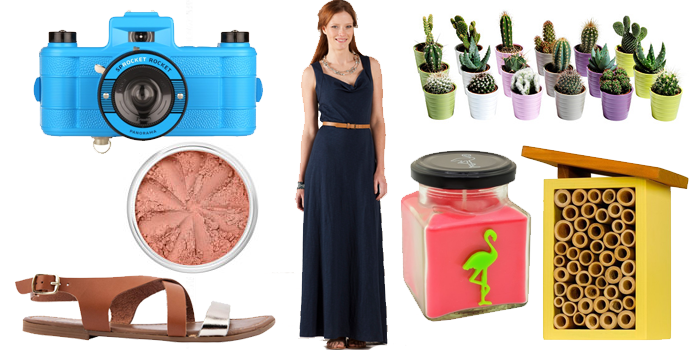 Maxi dresses, summer-scented candles, and cute indoor plants are definitely on my list too! Love your choices! What a colourful wishlist - I love all those succulents and planters and wish I had a garden big enough for a bee house!